Albert Whitman & Company, 9780807524350, 32pp. Louis needs to write an essay for school about young Abraham Lincoln. But it's 1951 in Alabama, and African Americans cannot use the public library. Mama says one day soon they'll be able to check out books, but Louis isn't going to wait! When he makes a brave journey into the "whites-only" library, something surprising and wonderful happens - he meets a brave young librarian. 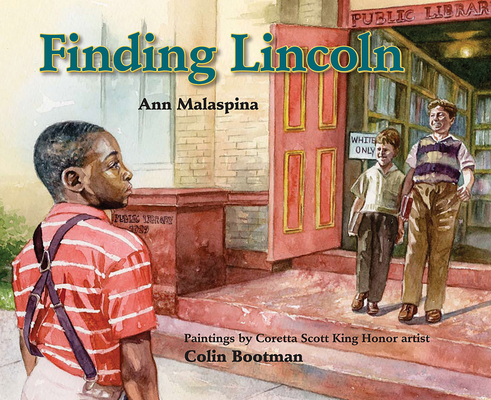 Ann Malaspina's moving story and Colin Bootman's rich paintings evoke the troubles and triumphs of days not long past. Includes a note on the history of racial segregation in public libraries, a brief history of Abraham Lincoln's life, and an "If You Want to Read More" listing.